How to build a traditional, wood-fired, clay pizza oven. 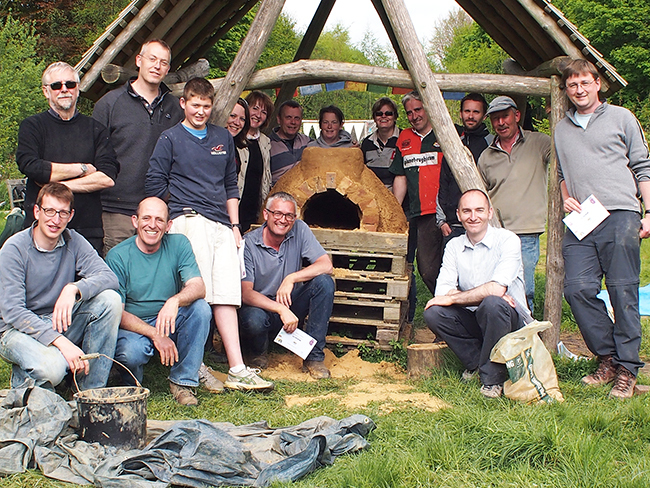 Thanks to everyone who came to the oven building course at The Sustainability Centre on Saturday. I had a really great time with you all. Here’s the group photo I promised to post. I’m running another oven building course at the Sustainability Centre, nr Petersfield if you fancy coming along. This next course is on Saturday 13th September and costs £75.00/person for a whole day. This is a hands on (and hands/boots dirty) course. You will learn everything you need to know to build your own oven and experience for yourself making and eating delicious pizzas for lunch, cooked in the Centre’s own clay oven. YOU ALSO GET A FREE COPY OF MY “HOW TO BUILD” BOOK. Places are limited and are selling out quickly so call soonish to guarantee a place. 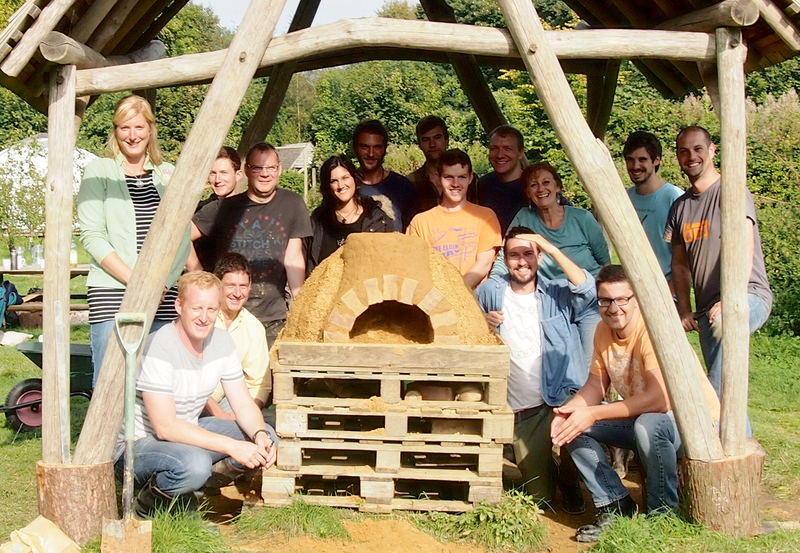 Yesterday I ran another clay oven course at the Petersfield Sustainability Centre for 18 lovely people. It was a glorious sunny day again and everyone seemed to have a brilliant time. I certainly did. During the day I asked one of the crew to make a note of the volumes of clay and sand we used (I’m not great at recording this stuff normally so thanks so much for doing this). Here’s what we used. NOTE: 1 bag of builders sand fills a 15 litre bucket. Brick arch, backfill and chimney – 2 bags of sand, 2 buckets of clay (we used a clay rich mix which made the material easier to manipulate). Also used 2 bags of sand to use as the former around which the arch was built. 11 bricks were used to make the arch. Insulation Layer – 3 buckets of clay, 2 large bags of woodshavings. The thing worth noting here is the ratio of sand to clay. Normally I prescribe a ratio of 2:1 but this is a rule of thumb. You need to aim for a material which holds firm, is not too soft (or wet) and not too dry such that it can’t be moulded very easily. If it is too wet (or if there is too much clay) it will slump around the base of the layer you are building. Clearly the plasticity of the material will depend upon the moisture content of the clay and the sand you are using. The drop test will help. I’d say always err on the dry side, you can always add a little water (or more clay) if you need to. If I weren’t such a rationale sort of bloke, I might begin thinking that something, or someone is effecting the weather on the days when I run these oven building courses. For it seems, regardless of the prevailing (and forecasted) horrendous weather conditions, that the sun always shines on our happy bunch of oven builders, and this weekend was no exception. 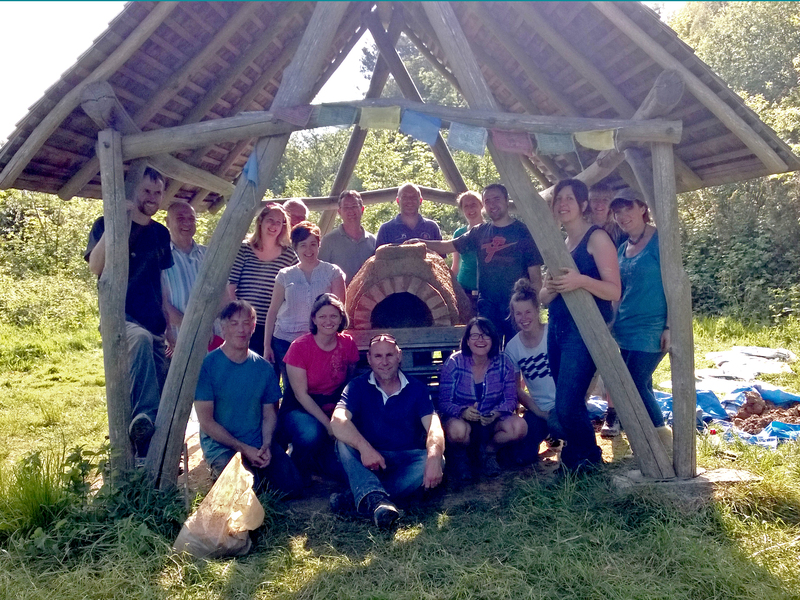 Last Saturday, sixteen people gathered from various places around the UK to learn how to build a traditional clay oven. And work we did. And pizza for lunch we had. And soap was used. And plenty of fresh air was received. And the sun did shine all day. And happy and contented spirits were we all. And life was surely lived. OK, I’m being rather poetic, but I think it’s fair to say that we had a great day. Here’s a little time-lapse movie of the day (don’t mention the arch!). So, here’s a couple of things to consider: 1. If you fancy coming along to one of my courses, the next one to be held at the Sustainability Centre will be on Saturday 14th September; 2. If you are thinking of getting married, and live anywhere near to the site in Hampshire UK, this is the day to do it if you want a guarantee that the sun will shine for your photographs (don’t quote me on this!!). Finally, thanks to everyone who came and, as usual, I look forward to seeing your completed ovens. PS if you wan’t a copy of any of the photos, email me. 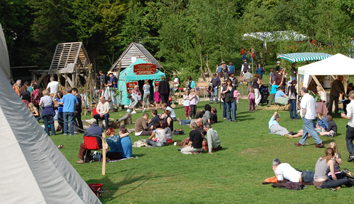 Each year the Sustainability Centre in Petersfield, UK, runs a Green Fair to raise money (and awareness) for their charity. It’s a really nice day, particularly when the sun shines (fingers crossed) and a beautiful location. You can listen to music, listen to interesting talks, make things, eat delicious food and drink local craft beers (gotta be good!). I’ll be there for the first time this year building an oven. Why not pop along and have a look. This year it is on Sunday 12th May, 11.00 – 17.00. Say hello if you see me (and let me know if you read the blog). 3, 2, 1…..You’re back in the room! Your Ovens Featured Part Two: Richard’s Oven in Cambridge, England. Clare Cormack on Beware of the Clay! Simon on Beware of the Clay!